Janie Treeborne lives on an orchard at the edge of Elberta, Alabama, and in time, she has become its keeper. A place where conquistadors once walked, and where the peaches they left behind now In the tradition of Daniel Wallace’s Big Fish and Amanda Coplin’s The Orchardist comes a debut novel of an unusual family who have made their home at the margins of an unusual place. To ask other readers questions about Treeborne, please sign up. Thought I would like this more - southern, a family saga of sorts. I don’t mind a story that isn’t a straight narrative, but I had a hard time connecting in this one and it was too much of an effort to concentrate on who was who and the various time frames after reading 50 pages . The eighty year old Hernando de Soto Dam in Elberta, Alabama was compromised and expected to crumble and flood the surrounding area. The Authority had been trying to purchase the lands and relocate inhabitants including elderly Janie Treeborne. Janie, a third generation Treeborne, refused to leave The Seven, her seven hundred acre parcel. She insisted that "me and this place is just too tangled up". In present day Elberta, Janie lives alone on the edge of a roadside peach orchard that she bought The eighty year old Hernando de Soto Dam in Elberta, Alabama was compromised and expected to crumble and flood the surrounding area. The Authority had been trying to purchase the lands and relocate inhabitants including elderly Janie Treeborne. Janie, a third generation Treeborne, refused to leave The Seven, her seven hundred acre parcel. She insisted that "me and this place is just too tangled up". In present day Elberta, Janie lives alone on the edge of a roadside peach orchard that she bought from Lee Malone. "It was sixteen dollar and a pack of chewing gum". Lee Malone taught Janie everything he had been taught about the peach business. Peaches were everywhere in Elberta...the "Peach Radio Show", The Peach Day Incident...even peach pits in mailboxes. Grandma Maybelle (Maw Maw May) was Janie's hero. Family dissension occurred when, upon her death, all Maybelle's worldy possessions were found to be willed to her daughter, Tammy. Sons Ren and Luther each received five dollars. Janie Treeborne was determined to protect The Seven at all costs now that grandmomma was gone. Grandpa Hugh, when not at work, was a builder of "assemblies", creations made from odds and ends found on land and sea. One "assemblie" of note was "dirt boy" aka "Crusoe", Janie's constant companion and comforter. Crusoe was a mud boy sculpture who magically performed human tasks, or so thought Janie. Janie recounts, in spurts, events and happenings in three time periods......1929, 1958 and the present. The family acreage, The Seven, was everything. It was the only constant in a family replete with unhappy marriages and unfulfilled dreams. "Treeborne: A Novel" by Caleb Johnson is a debut Southern Gothic read. Many of the quirky characters lie, cheat, steal and deceive. This reader felt a disconnect and lack of empathy for the woes of the backwater Treebornes. Putting this aside for now. May pick it back up later. Just don't have the concentration for it at this time. This was a very difficult read. I got through the first half of the book and then lost all attention and concentration. There are a few time different time periods (going backwards in time) which is confusing in and of itself. The characters, the place, the language and the habits, are all Old South. The characters are confusing in that they are all pretty much related in one way or another. But most especially confusing, is the weird boy/doll (?) Crusoe, made of sand and mud and whatever other This was a very difficult read. I got through the first half of the book and then lost all attention and concentration. There are a few time different time periods (going backwards in time) which is confusing in and of itself. The characters, the place, the language and the habits, are all Old South. The characters are confusing in that they are all pretty much related in one way or another. But most especially confusing, is the weird boy/doll (?) Crusoe, made of sand and mud and whatever other concoction. In one part of the story he speaks and moves magically, in another, he’s a lump of “stuff” that teenaged Janie carries around with her wherever she goes as he has ties to her artist granddaddy. Crusoe, aka Dirt Boy, was actually made as a work of art with materials but I’m lost as to how/when/if he was able to interact with others. And I’m lost as Janie, many years later, drags this thing around with her, it’s body losing sand and dirt, her having to reshape his misshapen head with clay. What in the hell is this thing????? This is a historic story of a small town and the everyday lives and quirks of its inhabitants and their legacy. I kind of enjoyed reading the first half but then I kept getting more confused as I plodded on. I did put it aside to see if I could pick on back up, but was still unsuccessful and getting irritated with it, so made the decision to stop ❌ just stop! Thank you so much to Picador for providing my free copy of TREEBORNE by Caleb Johnson - all opinions are my own. The story centers around three generations of the Treeborne family and their relationship with beautiful Elberta, Alabama. The story is rooted in Southern vernacular and is told in a series of flashbacks. The novel starts off in the present day with Janie Treeborne being interviewed about her life and the destruction of the Hernando de Soto Dam which threatens her home and livelihood. Thank you so much to Picador for providing my free copy of TREEBORNE by Caleb Johnson - all opinions are my own. The story centers around three generations of the Treeborne family and their relationship with beautiful Elberta, Alabama. The story is rooted in Southern vernacular and is told in a series of flashbacks. The novel starts off in the present day with Janie Treeborne being interviewed about her life and the destruction of the Hernando de Soto Dam which threatens her home and livelihood. This story is like none other, with a quirky cast of characters, and told with a peculiarity that I enjoyed. Multiple points of view, several generations, and three different timelines carry this story's remarkable unveiling of the Treeborne family who owned and operated a peach orchard in rural Alabama. I loved the cover but sadly the constant flipping from present day to the 50's and then the 20's and back again made it difficult for me to connect to any of the characters. GNab This debut novel is classic southern - Caleb Johnson can take his place among the best of them. He brings us angst and anger as well as love and laughter, and it all fits neatly into the background of small town boredom and anti-miscegenation laws. Although it would be hard to be bored in Johnson's Elberta, Alabama. I enjoyed the way he folded in the influence of the Elberta Tribe - something not often acknowledged in modern southern literature - and the understanding and love obvious in th GNab This debut novel is classic southern - Caleb Johnson can take his place among the best of them. He brings us angst and anger as well as love and laughter, and it all fits neatly into the background of small town boredom and anti-miscegenation laws. Although it would be hard to be bored in Johnson's Elberta, Alabama. I enjoyed the way he folded in the influence of the Elberta Tribe - something not often acknowledged in modern southern literature - and the understanding and love obvious in the characters of his older citizens. Also the importance of the local employers - not necessarily the Authority, bringing in and maintaining the dam on the Elberta River, but the locals keeping the town moving along in spite of progress. Dirt boy Crusoe is a classic, as well. And Hugh's found art - his assemblies that more or less took over his life. The appearance of the hole in Lee's guitar. I loved the way the orchard was passed down generation to generation, and it's importance in the community. And the women - I loved all the women. Janie of course, who is our spokesperson but also Maybelle and Tammy. Though the story travels back and forth through time, from 1929 into late 1959, it is easily followed and understood. the story is tightly written and the characters flawed but lovely. This is an author I will follow. I received a free electronic copy of this southern novel from Netgalley, Caleb Johnson, and Picador in exchange for an honest review. Thank you all for sharing your hard work with me. This was a book that I really struggled to read. It was written very well, but it wasn’t the kind of book that I normally enjoy reading. The details and descriptions are great, but for some reason, I just couldn’t get into the story. The characters talk with a slang, and it was hard to get past it at certain points. This venaucular was well written and takes a lot of talent to write, but quickly made me want to stop reading. There are also several different characters and different time frames, a This was a book that I really struggled to read. It was written very well, but it wasn’t the kind of book that I normally enjoy reading. The details and descriptions are great, but for some reason, I just couldn’t get into the story. The characters talk with a slang, and it was hard to get past it at certain points. This venaucular was well written and takes a lot of talent to write, but quickly made me want to stop reading. There are also several different characters and different time frames, and I was often confused in the midst of the story. Janie is the narrarator of the story which gives it an interesting twist. Other readers rated this book quite high, but did say that it was a challenging read. Maybe one day I will try to read it again when I have more time to focus on the story and really take my time with it, but for now it must go back on the shelf. I gave up on this book on page 55, and couldn’t bear to spend anymore time struggling through the pages. Thank you to the publisher, Picador, for sending me an ARC of Treeborne in exchange for an honest review. Receiving a copy of this book did not effect my opinion in any way. All opinions are my own. Janie tells her entire family history, and how her aunt Tammy came to be kidnapped, because everything had to be preserved. “Life ain’t easy Sister.” Janie grew up a wild thing, as wild as the land, drinking from the water tadpoles swam in. Growing up wanting nothing more than to be just like her old grandmother Maybelle, filling her ears with great stories about the land. Janie spends her time toting around dirt boy Crusoe, a creation of her eccentric junk artist Grandaddy Hugh, one that talks to her, to the Treeborne kin. A peculiar thing, this living dirt boy, or is the family crazy? Furious that her aunt Tammy and Uncle Wooten want to log trees to sell and to build a new home, even leveling her grandfather’s “assemblies” to make a foundation for the place, she refuses to allow them to destroy everything. Discovering her MawMaw May’s will leave Tammy The Seven feels like a manipulation. Tammy doesn’t love the place, she wants to sell, she wanted all her life to be a movie star.Janie knows it was MawMaw’s true intention to see the land split among the silblings and so she devises a wild mean plan of her own, to ‘take care of’ her aunt. She is desperate to save the land she is obsessed with. MawMaw’s death is the catalyst that causes the wild thing in Janie to grow. Telling of the past while being interviewed by her grandson, she too shares the story of Hugh Treeborne’s Seven Hundred Acre Junk Garden, his peculiar creations that a ‘Yankee’ took interest in and took advantage. We get to know many generations of Treebornes in the telling, all their longings and misdeeds. Lee Malone is as much a part of the Treebornes as Janie is, an African-American, the one who owned the Peach Pit bought for whatever money he had in his billfold, who later sells it to Janie, owning it all the same way he obtained it from the wealthy Mr. Prince. But Lee Malone is so much more than just the prior owner of the Peach Orchard, he and MawMaw had their own special relationship. When Tammy goes missing, somehow he is pulled into helping search, a funny thing considering all she has done to him. What happened to Maybelle, we at least understand more in the end, so many seemed to unravel with her tragic death. The stories are more about living with a family for a time, through the years and their antics in the wilds. Stubborn as hell our Janie is, even in her old bone days. Maybe the town has seen battles, but the Treebornes seem to battle each other and themselves more than anything. Hugh and Janie are eccentric characters, and the most fascinating but there were times I was lost in other characters stories taking me in too many directions. It’s a lot to keep up with, however the language is perfection and the southern dialogue is never abandoned, certainly not an easy thing to write. I am curious to read more from this author, who understands a south few others can write as genuinely about. DNF. Holy crap, this was hard to follow, not only plot-wise but sentence-wise as well. There were a lot of characters to keep track of and what was up with the dirt baby? Never did figure out what it was supposed to be because after about two chapters of crap that didn't make much sense, I gave it up. TREEBORNE is the story of southern family written in a truly authentic venacular and set in one of the most beautiful sections of Alabama. The Treeborne family is complicated. Those who knew them might call them touched, though that often means they have windows into worlds that others aren't privileged to see. I love the celebration of the organic world as well as Hugh, who was an artist in the vein of Howard Fenster. Beautiful story that transports you to the old South and a certain time and way of thinking. A wonderful first novel. Simply put: Caleb Johnson has the potential to be one of this generation's best writers. Read this book. Easily one of my top 2-3 books of the year, it's hard to believe this is a debut. I can't wait for his next work. 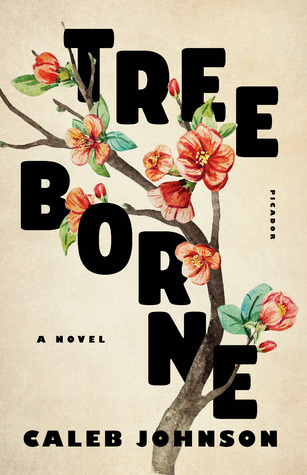 The debut novel of Caleb Johnson, Treeborne, opens with the elderly Janie Treeborne recounting possible, probable facts to a young relative where she explains how she came to live on her peach orchard; yet with the opening line ("The water was coming"), the novel forebodes a simmering presence underneath both the land and the story Janie unravels. Janie Treeborne and the rest of the Treebornes have lived on the edge of Elberta, Alabama seeingly as long as the land existed -- or at least since the The debut novel of Caleb Johnson, Treeborne, opens with the elderly Janie Treeborne recounting possible, probable facts to a young relative where she explains how she came to live on her peach orchard; yet with the opening line ("The water was coming"), the novel forebodes a simmering presence underneath both the land and the story Janie unravels. Janie Treeborne and the rest of the Treebornes have lived on the edge of Elberta, Alabama seeingly as long as the land existed -- or at least since the conquistadors from Spain came and went. In Treeborne, readers get almost the entire history of both the family and fictional Elberta, Alabama; however, to summarize the story does no justice to the beauty of the work therein. This is no mere history lesson of a made-up town. Somehow Johnson has managed to fabricate a cast of characters so real, so vivid, so unlike any other set of people that it feels as if you could complete a Google search on each name and find a dusty, torn, black-and-white photo of each one, stained yellow and brown with the years and tears. There's Tammy, strong willed and eager to make it to Hollywood where the moving pictures are made; young Janie, a strange and wild beauty cut from nature itself; Hugh Treeborne, closest to a patriarch the Treebornes have and a folk artist long before there ever was such a term; Lee Malone, the life-long friend of the Treebornes, so often internally torn asunder for his desires and race in a pre-Civil Rights Movement Alabama. It's a complex narrative that Johnson weaves. The wonder of it is that the layered complexity never hinders the story nor makes it reading it a bore. Far from it. While the cast is both diverse and wild, the man that haunts the entirety of the work, although his narrative lies mostly on the periphery, is the has-been football player Ricky Birdsong, damaged from multiple hits to the head, living somewhere between disabled and independent, pitiful. Ricky stands as a symbol of the retardation in the definition of the word rarely used: a musical suspension that resolves upward. It's Ricky's story that is perhaps the most profound in a novel where every person is rendered with love (and the heartbreak that so often ensues). Nothing is forever, after all. Ricky is also the key to one of the novel's multitude of themes: a review of the past will only reveal the dreams that have been destroyed, damaged, changed by outside forces. There is immense pain to be had in such reflection. It's a melancholy thought, but there's wisdom in Johnson's prose, elegantly stated when he writes of a character "[k]illing the future for the posterity of a moment that’d soon become past." So much of the novel jumps from the pages. Johnson slyly begins with little pathos early in Janie's narration only to knock you out midway through the novel with streams of emotional moments that build toward currents. Treeborne isn't purely obsessed in the morbidity and trappings of life's discarded goals. There are plenty of moments of humor as well. Often reminiscent of Charles Portis, the hilarity colors a number of scenes, from a young would-be kidnapper farting out of nervousness to the residents' rich vernacular (which, by the way, is very realistic of Alabamians of its time and place). In a nice balancing act, there are also many moments of oddities that have turns of downright horror. To share these would only spoil the creepiness that the novel hides in its darkest corners. The richness of the writing is almost unfathomable for a debut. It's a novel that is as lived-in as a favorite shirt; sections of the writing will remind readers of remnants of an era that linger around grandparents' trailers and workshops or old libraries and maps, no matter the locale. Okay, for starters, it's Jim Crow era Alabama. You get what you get. Lots of N-word usage and some instances of violence toward the African American character. That's not the author's fault, that's just the sad history of where our country was in the 1920s-1950s (when the brunt of this story takes place). Also, lots of animal cruelty/animal killings that, at at times, seemed to be there just for the shock value. I get why some of it was in there, but there wer MIGHT contain spoilers. Also, lots of animal cruelty/animal killings that, at at times, seemed to be there just for the shock value. I get why some of it was in there, but there were others I just thought "Why?" Thirdly, lots of goings-on that seemed weird and random. I'm not sure what was up with that Crusoe doll, but the end reveals that this whole story is the ramblings of an unreliable narrator, so how much is true and how much is false in the unreliable narrator's life is unclear. I strongly dislike unreliable narrator plots. Remember that old game many of us might have played as kids called "Made ya look"? That to me is what unreliable narration comes off as. Like the author can just say whatever they want and then at the very end, says to the reader, "Haha, made ya look!" Like it's a cheap ending to a weird story. A bit like the "It was all a dream" sort of ending. A cop out instead of a nicely wrapped-up ending that ties the story together. Instead what I got was along the lines of, "Oh, just forget everything this old lady said, she has no idea what she's talking about because her mental state is deteriorating." Okay, great, so now it feels like I've just wasted my time. But that might be my own personal thing with unreliable narration in a story talking. I'm sure some people love it. For me, though, I think there is only one story that I have seen where the "unreliable narration" was done well. So, clearly, I wasn't the intended reader, although I did finish it. Fourthly, I personally did not like a single character in this book. I engage best with stories if I find a character I like or can relate to. That was not the case with this. 3 stars only because it kept me engaged-enough to finish it, had realistic dialect of the characters (a skill that is hard to do that this author accomplished rather well), and wasn't too terribly written, meaning that I liked the way some descriptions were done. Not a lot of "telling." This did great on the "showing" aspect. I like great descriptions and I like books that show rather than tell. I could envision it all (even when I often didn't want to). Not 4 or 5 stars because at times it was hard to follow and the constant head-bopping and constant back and forth between past and present was starting to give me vertigo and whiplash. Treeborne is an epic family saga set in Elberta, Alabama and spans a period of 80 years, beginning in 1929. The story is mainly told through the viewpoint of the Treeborne family. Janie Treeborne provides the central narrative and is the spokesperson for the majority of the book. The story begins in the present day where an elderly Janie is being interviewed about her past and the destruction of the Hernando de Soto Dam, which threatens her home on the edge of a peach orchard that has been hande Treeborne is an epic family saga set in Elberta, Alabama and spans a period of 80 years, beginning in 1929. The story is mainly told through the viewpoint of the Treeborne family. Janie Treeborne provides the central narrative and is the spokesperson for the majority of the book. The story begins in the present day where an elderly Janie is being interviewed about her past and the destruction of the Hernando de Soto Dam, which threatens her home on the edge of a peach orchard that has been handed down from generation to generation. Through a lengthy series of flashbacks, we discover the extensive history of the Treeborne family and how their lives were rooted and intertwined with the history of Elberta. As the stories unfold, we begin to understand why Janie refuses to leave the land she fought her entire life for, despite the threat of incoming water. The references to peaches throughout the story were delightful and reading about the orchard was fascinating, which came about by conquistadors from Spain bringing and planting the peach trees. I enjoyed learning about the dark history of the Treeborne family and getting to know all of the quirky characters. The Treeborne's are no strangers to hardships. We learn how Janie's grandfather, Hugh, assisted in building the dam which held the water back for all of those years and he was determined to protect Elberta's legacy. Hugh made strange sculptures from found objects and created wild Janie's precious doll, "dirt boy". Hugh's wife and Janie's grandmother, Maybelle, was the postmaster and had a lover, Lee Malone, an African-American who formerly owned the peach orchard, harvesting on land where he was not well received. When Maybelle suddenly died, the town was propelled into chaos. The orchard was left to her daughter, Tammy. Janie's aunt, Tammy, was a dreamer and had farfetched aspirations to go to Hollywood and become a movie star since she saw her first film. Tammy's desire to clear-cut and sell the beloved peach trees prompted a young Janie to formulate a plan and kidnap her aunt, which caused circumstances to get out of hand and tore the wrong people apart. The messy, eccentric cast of characters seem like normal run-of-the-mill people but have all lived extraordinary lives. This story has an extremely unique writing style and a vast array of diverse, lovely characters. There is a lot of plot to keep track of. There is quite a bit of jumping around between timeframes and characters within the Treeborne family and key characters outside of the family. I did get confused at times trying to piece everything together. We soar across three generations and become acquainted with each character and feel for them. This story shows us how the past will always come back to the present. Overall, this is a rewarding, magical read and Johnson perfectly captures the rich Southern vernacular. Caleb Johnson — not to be confused with an American Idol winner — may be only a debut author, but he has delivered a lasting, impressionable novel with Treeborne. Set in the Deep South of the 1920s and ’50s, this family saga takes a little bit of warming up to, but, once the reader manages to find their way through the dense, lilting Southern prose, the rewards are immense. This is a novel about family and community, and how the two are intertwined. It is also a book about the magic of art, and Caleb Johnson — not to be confused with an American Idol winner — may be only a debut author, but he has delivered a lasting, impressionable novel with Treeborne. Set in the Deep South of the 1920s and ’50s, this family saga takes a little bit of warming up to, but, once the reader manages to find their way through the dense, lilting Southern prose, the rewards are immense. This is a novel about family and community, and how the two are intertwined. It is also a book about the magic of art, and how transportive it may be. And it is a novel about failed justice, about people being convicted of the wrong things and people having their claims stolen from them. But, mostly, this is a book about what happens when a community dies and what happens to the people who are so tied to it that they refuse to leave. Narrated from the present day, the novel’s framing story is about Janie Treeborne, an elderly woman being interviewed by a reporter she mistakes for being kin; she is one of a handful of people that refuses to leave the town of Elberta, Alabama, as a nearby 80-year-old dam reaches the end of its natural life. This means that the dam needs to be imploded and people evacuated in advance of the event to prevent a bigger, unforeseen disaster from occurring. Janie narrates, in the third person, stories from her youth in the 1950s — when her aunt Tammy mysteriously is kidnapped, though the locals think she’s gone to Hollywood to seek fame and fortune — and also stories from her grandfather’s era of the late ’20s, as he was one of the builders of the dam. The novel is largely plotless, so these stories are really vignettes in a sense; some are connected while others are not — or at least don’t appear to be on the surface. I normally don't leave reviews, but Treeborne lingered in my mind and I just have to share these thoughts. This book was a fantastic read, immersing readers in its world right from the first page. This is not the kind of book you rush through, nor is it for the reader who doesn't enjoy close-reading. Johnson does a great job of elevating relevant details, designed to let the reader inhabit Elberta, Alabama, his fictional Southern town that feels as real and solid as the book in the reader's hand I normally don't leave reviews, but Treeborne lingered in my mind and I just have to share these thoughts. This book was a fantastic read, immersing readers in its world right from the first page. This is not the kind of book you rush through, nor is it for the reader who doesn't enjoy close-reading. Johnson does a great job of elevating relevant details, designed to let the reader inhabit Elberta, Alabama, his fictional Southern town that feels as real and solid as the book in the reader's hands. The writing here has true heat, and it pulls you right down into the setting and characters. That's a good feeling, given that every character in this book is fully-fledged. (Janie, Maybelle, and Lee Malone were this reader's favorites.) We get to inhabit their thoughts and see how they interact with each other and the Elberta land. Truly, even characters who aren't biologically part of the Treeborne family feel as if they are, so compressed is the rendering of this world. It's been a long time since I've come across such a stunning, place/family-driven novel, and this one serves, I think, as a model for how it's done. What's most compelling is the way time blends together. Some characters die and then reappear again. The novel poses certain mysteries that it only answers later. Treeborne reads like a grandmother telling stories that blur into one another, because the essence of the story is what's most preserved in memory, the beginnings and endings becoming sharper only as she keeps ruminating. Or, as Johnson so eloquently writes, "You see, it ain't memory that ever goes, but us being able to peel it back" (191). Treeborne is a truly stunning debut novel. The characters are so complex and interesting that the multiple point-of-view and multiple time periods is definitely the best way to tell their stories. Johnson does a masterful job of taking the reader in and out of the past while giving each character a very unique voice. Each character changes throughout the story as you fall in and out of love with each of them. The ending is perfection and the little plants along the way left me as a very satisfie Treeborne is a truly stunning debut novel. The characters are so complex and interesting that the multiple point-of-view and multiple time periods is definitely the best way to tell their stories. Johnson does a masterful job of taking the reader in and out of the past while giving each character a very unique voice. Each character changes throughout the story as you fall in and out of love with each of them. The ending is perfection and the little plants along the way left me as a very satisfied reader on the last page. The prose itself is both beautiful and jarring, as I think all great Southern literature is. If you are a fan of Flannery O'Connor, this is absolutely in your wheel house. That being said, I had a hard time at the beginning. The story didn't grab me as much as I might have liked until I was about one-fourth into the book. I had a harder time connecting with Janie, which could have been the cause of my slow beginning. While I ended up loving him and the fantastical element he adds to the story, Cursoe was a bit hard to wrap my mind around at first. These complaints are nit-picky though and I wouldn't be surprised if I'm the only one with them. I highly recommend this book! I think it will end up being one of the great reads to come from 2018. Holy wow, this is gorgeous. Full disclosure: I know Caleb and have loved what I've heard of his writing previously, but Treeborne hit me with the full force of what he can do with words. The novel's like the love child of Faulkner (granted I've only read The Sound and the Fury but even so), Marquez, and Robert Johnson, the characters compelling and their acts and the land they live in both beautiful and dark. As real as Elberta feels (seriously, you can practically taste those peaches), it's not Holy wow, this is gorgeous. Full disclosure: I know Caleb and have loved what I've heard of his writing previously, but Treeborne hit me with the full force of what he can do with words. The novel's like the love child of Faulkner (granted I've only read The Sound and the Fury but even so), Marquez, and Robert Johnson, the characters compelling and their acts and the land they live in both beautiful and dark. As real as Elberta feels (seriously, you can practically taste those peaches), it's not mundane in any way--aside from the lyrical, stunning descriptions of the town, there are also occasional weird glints of magic that fit in perfectly and feel utterly natural. Structurally, the book sprawls over decades and generations, and while it's sometimes hard to keep track if you're not paying attention, it all comes together in the end, and does so in a way that made me ache. Also: Crusoe. Sweet, strange Crusoe. I love that little guy. Four and a half stars. Exceptional first novel that rewards a close reading and is worth a second read. Highly recommended tale of memory, loss, and the stories we tell about both. With peaches and conquistadors. This novel builds slowly, but one is soon immersed. Kind of like rising floodwaters. If you have ever been fortunate enough to sit with an elderly person and invite them to share the tale of their life, the structure of this novel will not seem unfamiliar to you. This is a great novel fr Four and a half stars. Exceptional first novel that rewards a close reading and is worth a second read. Highly recommended tale of memory, loss, and the stories we tell about both. With peaches and conquistadors. This is a great novel from a great writer. Thank you to NetGalley and Macmillan-Picador for this ARC of Treeborne by Caleb Johnson. This book is due in your favourite bookstore on June 5, 2018. I am not going to lie, this was a hard read. I found the story confusing and anything to do with Crusoe very weird and would have like to understand that part better. The characters were interesting and well defined. Caleb Johnson has a talent for describing the landscapes. Unfortunately, in my opinion, there were too many loose ends and the ending Thank you to NetGalley and Macmillan-Picador for this ARC of Treeborne by Caleb Johnson. This book is due in your favourite bookstore on June 5, 2018. I am not going to lie, this was a hard read. I found the story confusing and anything to do with Crusoe very weird and would have like to understand that part better. The characters were interesting and well defined. Caleb Johnson has a talent for describing the landscapes. Unfortunately, in my opinion, there were too many loose ends and the ending did not bring a conclusion to the story. Johnson has worked as a newspaper reporter, a janitor, and a whole-animal butcher, among other jobs. He has been awarded a Jentel Writing Residency, and a Walter E. Dakin Fellowship in fiction to the Sewanee Writ Caleb Johnson is the author of the novel Treeborne. He grew up in Arley, AL, studied journalism at The University of Alabama in Tuscaloosa and earned an MFA from the University of Wyoming.